In October last year, the Pullman was buzzing with excitement and inspiration for the third official Journey to Excellence event. 300 guests arrived to listen to the fantastic panel who talked together on unconscious bias, diversity and change. 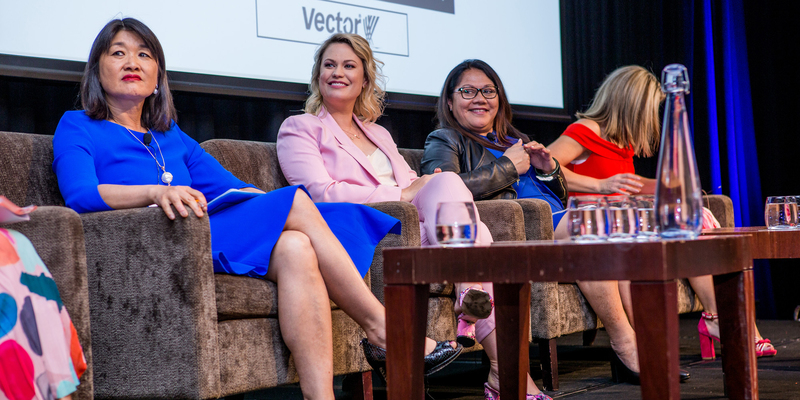 The panel consisted of premiere footwear designer, Kathryn Wilson, current Director of Barfoot & Thompson, Kiri Barfoot, administrative law expert, Mai Chen and establisher of Sustainable Prosperity, June McCabe. The panel was chaired by New Zealand TV broadcaster, Carly Flynn. Work environments are changing all the time, and – with the help of added platforms such as Journey to Excellence – people are being inspired to strive harder and higher to achieve success. It was an enlightening event, enjoyed by all. After the panel concluded, guests flooded into the outside area to mingle. The next Journey to Excellence will again be hosted on the 15th of February. The following is part two of the transcript of the event, which first featured in the November/December issue of M2woman. June, as someone that works with and empowers Maori and Pacific leaders, how difficult is it for them to be heard? How difficult is it for someone of a minority to get heard in the leadership role, or to even get into a leadership role? June McCabe: So, we’re coming into another wave of change within the Maori and Pasifika place because, as Mai was talking about, the browning effect is very real and the population of the country in 2030/2040 about the place we’re going to hold in this. So, that obligation and responsibility in a leadership context is, what are we going to do about that? How do we contribute? How do we create whatever we need to create? And you can work at the end of spectrum about that, you can play with the big guys at the top of town, the big successful enterprises, the Ngai Tahu’s and Tainui’s, and everyone knows because these are billion-dollar enterprises. Or you can go to communities like in Northland where I’m from, and there’s poverty and deprivation and significantly so. You can go to Mangere and Manurewa to see some of that deprivation too. So, when you’ve got this major set of issues you can’t not be brown and not be part of that and what it means, and how do you bring people along in order to create a Maori, Inc. within the New Zealand, Inc. I think it’s no different from the role you might want to play in your own ‘What difference do I want to make in my time on this earth?’ Because otherwise you’re an oxygen thief, right? So, I suppose I always maintain you grab a place, a space. You take that space in a moment in time and you take what’s available to you; the resources and the friends, and we call this super-connecting. You super connect so you can make something different happen in that community or for the people around you, because why else are we here if it’s not to do that? It’s just sometimes how we choose to do these things is the sway versus quantum leaping to another place really quickly and how you might then bring people with you. So, it’s constantly looking at how to work in that space and the Maori network in a leadership sense. We have Mai who’s very much part of the Maori network because of her strength around the Waitangi and/or with Maori enterprise. So, Mai becomes the whanau because she’s part of who we’re bringing to super connect, to help us grow our economy, the Maori economy. Because the Maori economy strengthening benefits all of New Zealand, right? I’m interested to hear your thoughts on the role unconscious bias plays in our diversity problem. Mai, are you an advocate for training for unconscious bias? Mai Chen: Let’s define it first because people say, ‘Well why on earth do I have to do this unconscious bias training?’ Well, all that unconscious bias is, is a bias that you are not conscious about, and therefore you are acting and doing things. Sometimes you might do things and think, ‘Wow, why did I do that?’ If you are in any position of leadership and management, you need to understand your own motivations, because if you don’t you will hurt people, and if you don’t you will make bad decisions. So, I think actually everybody knowing their unconscious biases is absolutely critical. That’s the first thing. The second thing is that you can’t tell who has them and who doesn’t have them, and what they are. We all have unconscious biases and for some of us who have experienced discrimination, we are more open minded and open eyed about it because we can see it. June has kindly said that I’m part of the Maori whanau, and part of the reason I find it very easy to work for Maori is because I’ve suffered discrimination too. So when they explain it to me I can see it. What about diversity policies and transparency? Kiri, do you have any diversity policies in place at Barfoot & Thompson? Kiri Barfoot: We’ll have the normal standard policies but it’s a reflection of our workforce. Our sales team is a reflection of Auckland’s population. We’re mainly based in Auckland, Northland but if you look around Auckland, isn’t it the fourth most multi-cultural city in the world? So, our sales team is 30 per cent Chinese and 10 per cent Indian. The rest speak 60 different languages, a mixture of every other country in the world I think. It’s probably 30 to 40 per cent European, if that, and that’s changing dramatically every year. So the workforce reflects that, because when people buy a house, different people buy a house; not just old, white people. Yeah, but then we get to the management team and that is not reflective of the sales team or reflective of the Auckland population. So, there’s a disconnect there and that’s tricky, right? KB: It is that stereotype of older white guys and about 25 per cent women. It’s been consistently 15–25 per cent for the last 10 years. What happens when I do a lot of interviews, people apply but out of all the applicants, generally it’s only 30 per cent of women, so that’s just instantly harder to pick a woman. In terms of ethnicity, very few Indians or Chinese people actually apply, compared to say 10 per cent out of the whole applicants. So, again, it’s hard to have that diversity if you don’t get the applicants in the first place. What’s holding Chinese, Pasifika, Maori women back from applying? MC: I think it’s really important to have role models because otherwise people think, well, I can’t do this because nobody who looks like me does this job. I think it is really incumbent on us to put on our big girl pants and put ourselves up for roles. I’ve just put myself forward for a couple of things that I don’t actually really want to do, but there aren’t any Asians doing these things, so I thought we need to put ourselves forward. I was very fortunate. I was asked to sit on the Bank of New Zealand Board and it’s one of the best Boards in the country, it’s a fabulous Board. I said, yes. Why should I say yes? I should say yes because there aren’t enough Asians on boards. We did the measure when we set up New Zealand Asian Leaders. Five per cent of companies have Asian directors on them and this is measuring the top 100 NZX companies, over half of which had their biggest markets in Asia. So, go figure. I don’t know how that works either. There’s also another problem. You talked about unconscious bias, and I’m now talking about conscious bias. There are second generation, third generation people, who are applying for jobs and not even getting an interview because they have impossible sounding names. So the presumption is that they weren’t born here and they don’t speak English. Now, I hired one of them and he’s a senior associate at my law firm. He’s a second-generation Fijian Indian. Not surprisingly he speaks English, he was born here. His name is difficult, I had problems saying it. But the thing is, I got beyond looking at his name. I asked him about him, I asked him about his family, and then I realised the reason why he didn’t have a more stellar CV: It was not because of his lack of talent, it was because he looked the way he looked. I hired him. So actually, people are saying to me that there’s a huge capability issue in New Zealand. Actually the problem at the moment in terms of profitability and growth is not actually business, it’s capability. It’s getting enough staff and I think it’s because people are not looking properly at the talent pool. In one of our previous panels, one of our other panellist’s take-home point of the session was to have anonymous CVs. Is that something that you would advocate? MC: I think it’s so important, except that I confidently predict that when we all wake up we will realise that IQ and EQ is not enough. Actually looking at a person’s CV and seeing the predictors of diverse thinking: different background, speaking different languages, coming from different religions, having a really different upbringing, being on the outer, these are predictors of diverse thinking and they shouldn’t be dumbed down. You should be recruiting in favour of these characteristics, so that’s the only reason why I wouldn’t have name mutual CV’s. But, if you want to recruit for top people at the moment, I’ll give you a little secret. My sweet spot? I go for 1.5 to second generation ethnics because the research shows that there is a $23,000 decrease in salary if you are visually diverse. It’s called the ‘migrant effect’. You will generally be over-qualified for a role and you will generally be underpaid. That means that there’s a segment of talent out there where I could go and offer them good salary packages and a good job, and they will accept it. Especially in a company where they will not be discriminated against. I was encouraged this week to see that the new President of the New Zealand Law Society has been elected. She’s a young Pasifika lady who lives in Gisborne. Mai, is this the legal industry waking up to the horrors of its past that have very quickly come to light in the last year? MC: I’m very excited. When I was a young lawyer, I remember saying to people ‘This is the way I’ve been treated’, and I was told ‘Oh, it’s because you’re young. Don’t worry about it. When you get older, it won’t happen to you’. Then after 30 years and it’s still happening to you, you realise that actually, it’s not because you’re young. I think it was a water shed moment and I think Tiana Epati will be wonderful. She recently gave a speech about her experiences. They’re horrendous, she’s suffered a lot of discrimination. Looking like that is not particularly helpful if you turn up in a courtroom. There was a time when we even had to wear wigs and we looked even more ridiculous. Yeah, you’re laughing. You might have looked ridiculous, I looked worse because clearly I didn’t have white hair. So, I think it’s really significant and I think it’s something that all professions should think about. MC: Yeah, I hope we’re not just ticking boxes, because I’ll tell you the trouble with ticking boxes. If you’re just getting a person on board because they’re the brown tick or they’re the gender tick, then you don’t expect anything from them, when they speak up you sort of look in that corner and think, ‘Right, did you say something?’ then you’re just going to go back to the status quo. You’re not going to let those people make any contributions. As I said recently, when the Hon Grant Robertson was talking about getting more women onto sports Boards, I said, ‘Minister, there’s only one thing worse than not having women on Boards, and that is having women on Boards and it not making a blind bit of difference’. We have to get beyond compliance ticks, and that’s the same for your D&I programme. If your D&I is just ‘Oh my god, we have to do this. Let’s take these two women and be done with it. I don’t care if the next one is a rocket scientist, I’m not taking her’, then we have made no progress and all we’ve done is got everyone’s backs up. We’ve also created gender fatigue, ‘Oh god, we’re not talking about D&I again’. That’s why I say that the most important take home that you need is to be clear about the why. Why are we here? Why are we banging on about this? Is it just getting a meal ticket for all of us because we’re women and we want to be able to say, ‘Hey, I’m a woman. Let me in’? No. It’s about getting the top talent at the table. That’s what it’s about, it’s about reflecting the customer base. JM: Can I just reinforce, because this gets to the heart of authentic leadership: why am I here? What difference do I want? What’s my legacy? What’s my contribution? And so that’s the truth of you, and when you aggregate if we signed up that way, then that’s the motivation and that’s an energy that can create so much change. But what happens is, I think there’s things that while looking over the green-eyed monster fence, those things create different kind of responses to things. One of the interesting things I find is how nasty we can be to each other. We talk about people all the time: have you ever noticed that? How someone is just not good enough. I think someone mentioned it earlier. So, we can’t even be kind. There’s something about judging all the time, and yet everybody has got a contribution to make. But when it goes up into the boardroom, there’s a lot of discipline that’s got to go around to bring the best out. But on a day to day basis, we practice authenticity or not, right? And the thing that I notice is, whether it’s a group advocating for something, they advocate but everyone else has to be wrong for them to advocate for that, whereas it’s just an ‘and-and’, you know? We don’t have enough ‘and-and’ conversations; we have the right or wrong conversations. And the problem with that is, in a society that’s ever changing and needs are ever changing and challenges are big and small, there’s this whole thing going on. I feel for the kids of today trying to make sense of life for themselves because it’s so fast paced. It’s not like you can go through, here’s the career path. When I was at school, you could see all the way to becoming a lawyer. These kids today can’t see it all the way; they can only see a couple of years. This is me thinking about how you bottom up things. We can’t change the numbers overnight, we can’t have that many people sitting in these seats overnight, we can’t have X number of Maori Pacifika real estate agents overnight. But if we can have everyone still on the page of caring, kindness, empathy, understanding, and spending more time on things we’re unconscious about, that’s our heritage for many people. So many people have never had certain experiences that are actually part of our DNA as a country. So there’s a huge opportunity in the room, all of this energy to really turn it a certain way and make such profound difference. What’s the one thing that you would like to see changed in order to make our diversity better? KB: Well, I’d just like more women or people of minority ethnicities to come to apply for jobs. Well, there’s plenty of them here in this room today. KB: Management jobs, leadership jobs, not necessarily in a business but in the community or whatever your passion is, to be the leader. Have that confidence to stand up? KB: You’ve got to exude that confidence because a lot of men they give themselves, 11 out of 10, right? ‘I’m 11 out of 10, I’m perfect’. You ask a man ‘What’s your weakness?’ in the job interview and they start talking about their golf or something like that. But you ask a woman and you can’t shut her up. Just be more confident, you can do it. I’ve seen men who can do it, so women can do it. Chinese, Maori, wherever you’re from, it doesn’t matter. It’s what you put into it is what you get out of it. So, that’s what I’d like to see. Even if you don’t want to go for a management job yourself, you must know someone who’s applying and hasn’t got it. Just give them that confidence and say you are better than you think, you can do it, you don’t have to be perfect before you apply for that job. Be six out of 10, seven out of 10. You’ll learn on the job. Everyone when they first get into management, I remember my first management job, I was 30 and it was in Waiuku. I was from the North Shore so I was a ‘city girl’, and they looked at me and I looked at them and I don’t know who was more scared. But, you just got on with it. You don’t admit that you don’t know what you’re doing, you just work it out. There’s always someone you can ring up or there’s always someone you can find out the information from. Get yourself a really good network of people that are going to support you. I think that’s really important. Diversity, how do we fix it in New Zealand? JM: Seamlessness. It’s to bring all of you to the table is what I mean about seamlessness, right? That you don’t need to leave any part of you anywhere because who you are, you come in as one person. The thing I think we try and do is do the identity of the moment and then go in a door and we’re a different person. So, if we embraced that seamlessness idea and could see the value of that, because from that value you actually do get dynamic interactions. These are ways in which processes improve, innovation happens, and we underestimate the part of us. The nurturing mum who drops the kids off in the morning is the same person that’s sitting in the board room demanding some things from management. If you bring both those bits of hardness and softness in the room, it is powerful. Kathryn Wilson: I think for me it would be around remembering to stop and slow down and supporting other people’s dreams and the way they see the world. I have been so fortunate in my career and in my personal life to have so many people say, I’ll give you a minute of my time. I think that’s something I will always hope in leadership and definitely in terms of management that always exists, because the more that we can slow down and stop and listen, or just imagine how other people are feeling and what that means to them, then I’m sure that brings so much more to their lives, and definitely to mine. In New Zealand there’s no seven degrees of separation, there’s about two, so we are all really good at networking and at making other people’s ideas come to life. I think I really take a lot of joy out of that, as I’m sure everybody does. So, I think in management and in leadership, just stopping and thinking about other people’s ideas has been my learnings of what’s been important in a team environment. MC: That we change our lens and stop seeing diversity and difference as negative and bad, but as positive and potentially very beneficial to the company. I recently was in the Singapore Aquarium. It’s the best aquarium in the world by the way, but I realised then they had a principle of nature’s diversity: every single one of those damn fish were different. They had wild and whacky colours. I looked at them, and even the stingrays, they’ve got three marks on their body and it’s their unique fingerprint. I thought, isn’t it strange that a principle of nature is difference, and yet we’ve grown up in a society where we are all told that we have to fit a stereotype or else we’re going to fail in our careers. Well, that’s bullocks, and the whole point of having you here today in the room is that you can be the tipping point to change the lens. So, at the moment we have a really small lens through which we look at people and say, these are the criteria for success. Let’s change the lens guys. Let’s broaden it and let’s give it a bit of colour. Let’s say ourselves, ‘This person’s different, I’m interested in this difference. I think this difference could be good for our company’. We can all do that. We can change our own lens and thereby we can change the world.